When we engage with a new country or area we want to work directly with you to tailor the training and support we provide to your specific needs. We don’t know if our programmes will work in your area but we would like to work with you to try them. In Russia and Tajikistan Mellow Programmes have been used to support the deinstitutionalisation of children, on going reform of child protection systems and the development of new community social services. In Germany, the programmes have engaged vulnerable groups whose needs were not being met through mainstream services. 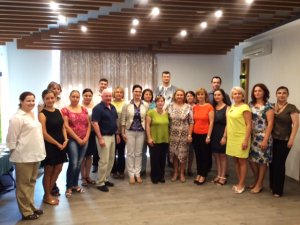 Dirk Meyer and Rachel Tainsh with Stela Grigoras Minister of Labour and Social Protection, the P4EC team and the Sept 2016 Going Mellow trainees. In 2016, we began working in partnership with Partnership for Every Child Moldova to support families through the introduction of Mellow Programmes. Our joint work focuses on preventing babies at risk of being abandoned and improving support for vulnerable parents in the community to enable them to more optimally care for and meet the needs of their children. Moldova is a small country sandwiched between Romania and Ukraine less than half the size of Scotland with a population of 3.5 million. Moldova emerged as an independent republic following the collapse of the Soviet Union in 1991. Moldova’s current Strategy for Child Protection focuses on actions to reduce the number of children in institutions, prevent separation of children from their parents, and a gradual ban on placing children under the age of 3 in residential care. Current family support services are inconsistent and do not address the full range of identified needs. We have trained 20 new practitioners so far, and the first groups are due to finish by the end of March 2017. We anticipate that at least a further 5 groups will run in 2017. We look forward to sharing the results of the evaluation. The programme is very interesting for the Republic of Moldova. I consider it is needed, useful, something different. I learned in this training, both in terms of theory and practice, how to organize the whole process of organizing a group, since recruitment and ending with the evaluation of the group. Mellow Parenting is proud to be a member of Scotland's International Development Alliance, the Network of International Development Organisations in Scotland.